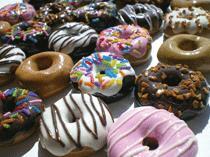 Large quantities of soda are bad; doughnuts are OK. Unfortunately, that's the message New York Mayor Michael Bloomberg sent with the city's latest proposal to tackle obesity. Large quantities of soda are bad; doughnuts are OK. Unfortunately, that's the message New York Mayor Michael Bloomberg sent last month with the city's latest proposal to tackle obesity. Bloomberg likely had good intentions when his administration said it was proposing a ban on sugary beverages served in containers larger than 16 ounces. But the plan was interpreted by many as overreaching and largely ineffectual. For one, consumers would still be able to buy multiple bottles or cans of soda totaling any amount greater than 16 ounces. Second, it also appeared to be an infringement on New Yorkers' right to buy a product that, unlike earlier Bloomberg target, cigarettes, doesn't hurt anyone but themselves. Bloomberg did himself no favors when he joined in the party on "National Doughnut Day," the 75th annual celebration of the sugary good. Calorie-counting critics in the media were quick to point out that some doughnuts have more calories and grams of fat than the average 16-ounce soft drink. The mayor's defense on Today didn't help his case much. He said that "One doughnut's not going to hurt you. In moderation, most things are OK." However, the perception that Bloomberg was hawkish on soda - and consumers' right to buy it - and soft on doughnuts became reality with every photo of a New Yorker munching on a giant doughnut. Bloomberg rightly recognizes that America has an obesity problem, and New Yorkers are no exception. He also accurately pointed out that his plan to ban smoking in the Big Apple's bars and restaurants was panned by many critics years before it was a model for many other American cities. Yet at the time, Bloomberg didn't ban smoking only to celebrate "Smokeless Tobacco Day" the same week. The Bloomberg administration's misstep was not that it tried to tackle obesity and poor dietary habits among low-income consumers - for that it should be lauded. But the mayor's office should have been more careful than to connect itself to one sugary substance while seeking to cut sales of another.